Every app I want or need is available on Android. For the most part the functionality and features are the same between Android and iPad versions. Sometimes the iPad version has more features, sometimes the Android version does. In general, there isn’t much difference. Evernote- a must have app and service for pretty much everyone - teachers, students, administrators, mom's, dad's, business people, etc. The Android App is excellent and you can sync your notebooks to your phone for offline access. Take notes, clip web sites, upload files, upload and search photos, share notebooks, and much more. Google- search, Gmail, Calendar, Reader, Google Plus, Docs, Google Tasks, Blogger, Maps, Google Voice, Voice Search, Translate, Music, goo.gl, YouTube, and much more. They all work great, with Docs having full editing features and Translate even translating spoken word. QuickOffice- access, view, and edit Word, PowerPoint and Excel files.Free version comes with phone and can view documents. Pro version adds editing for a fee. Cloud Storageapps- Dropbox, SugarSync, - access, upload, download all your files and data from your computer to the cloud and your device. 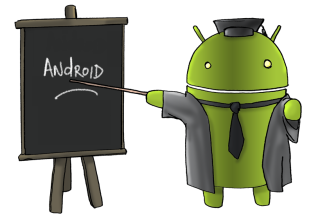 What are your favorite Android Apps for Education?